I’ve only recently found a few of David Burton’s books recommended to me by a friend. I learned a lot from this short book on the Freemasons. 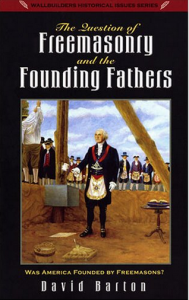 Burton’s premise is that America’s founding fathers were not as involved in Freemasonry as many would have us believe, and that those who were, were not involved very much, and that even then Freemasonry was not at all what it is today. With over 300 footnotes in a little over 100 pages of text, Burton does a thorough job of presenting material from both sides.